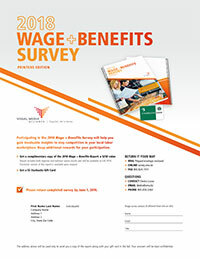 Participating in the 2018 Wage + Benefits Survey will help you gain invaluable insights to stay competitive in your local labor marketplace. Reap additional rewards for your participation. » Get a complimentary copy of the 2018 Wage + Benefits Report. Valued at $250. Get a $5 Starbucks Gift Card. Report includes both regional and national survey results and will be available in Fall 2018. An electronic version is available upon request. Please complete the survey by accessing it below and return via mail, fax, or email.. Right click on the link below, select "Save As" and save the file to a location on your computer you have access to. Open the file using Adobe Acrobat Reader and fill it out. To return, simply email as an attachment or print it out and either mail or fax it back to us. Request a pre-printed survey to be mailed to you if you have not yet received one in the mail. Contact Diedra at diedra@vma.bz or 800.659.3363.